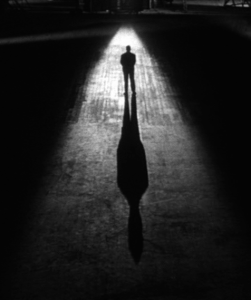 With Halloween and all manner of darkness and scary-stuff-that-goes-bump-in-the-night approaching it seems appropriate to consider the psychological concept of one’s shadow. We all have the “light” parts of ourselves – the parts we are proud of, maybe the things we tend to share on social media. But we also have a shadow – it contains everything we think of as “not me.” For Carl Jung, Robert Bly, and many more modern thinkers cozying up to the shadow is an integral part of embracing our whole Self, and a vital part of true maturity. Bly called shadow “the long bag we drag behind us.” By this he meant the shadow is where we place everything that is “not me” from the time we are young children. “I am not loud. I am not angry. I am not sexual.” But, of course, we are all those things – loud, angry, sexual – at different times; along with many other traits considered dangerous. We’ve just tried for years to fit in, to be nice, to be loved. And to be loved, as a child, you may have been told that you can’t be loud. You probably couldn’t be as angry as you wanted to be. You couldn’t express your healthy sexuality. Even though these are all natural inclinations our parents rarely know how to handle them well! So as a child you unconsciously decide to suppress some of those energies. And maybe as you grow up you want to express your physicality, your aggressiveness, but that’s not what nice little boys and girls that want their parents affection do. So you rein it in. You put it in your own long bag, and it does indeed drag behind you. But there’s probably that one kid that doesn’t – or can’t – rein it in. Think of him or her now – the problem child in your 2nd grade class. And you judge them for being so aggressive, when what you may well be is envious! You yearn for that level of freedom! It turns out our envy can be useful if we are aware of it. It can point us towards our positive shadow – more on that in Part II of this post. Basically, in order to be nice we get by having access to only a fraction of our total life energy. Shadow work is a process of connecting to the parts of the Self we think of as negative, to all of that discarded energy. Certainly, it is the duty of family and society to take the edges off of our youth so that they can grow up and not get in to trouble. But it is our job as adults who have made it this far to be archeologists of the Self. To find that which we have cast off into the rubbish heaps of our psyche. For it is there that we may reconnect to our full Self, and find access to a deep well of vitality. Because let’s face it: the person who is not sometimes loud, angry or sexual is boring. And they may well be stymied in their search for creative success, sexual fulfillment, and deep meaning because they are being inauthentic and are cut off from their full selves. This is why we look in the shadow – to find our full authentic selves. But shadow work is not easy. For years I had disturbing nightmares about mysterious sea creatures coming up from the depths of the ocean. Many tentacled, slimy things, primitive and raw – terrifying. A manifestation of my shadow, that which I could not accept and was terrified of. Then, one evening I dreamt I was on a raft. And a huge tentacle came out from under the raft, connected to what I imagined was an enormous beast below. It wanted something. It was under me and could crush my tiny raft in a heartbeat. Then, for the first time I realized the creature wanted love and affection and in a moment of bravery I hugged the slimy tentacle. I haven’t had a sea creature dream since. I now think of this dream as a turning towards that which scared me – the inchoate parts of my Self that I couldn’t accept. The shadow. How else can we do that? Wait for Part II of this post coming after the weekend . . .